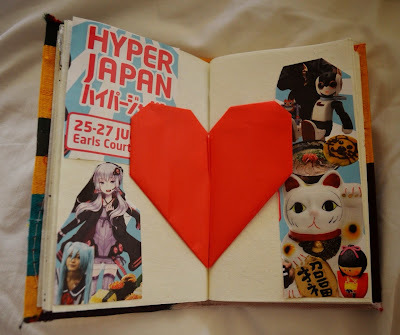 A couple of weeks ago, I went to a festival called Hyper Japan which is basically a giant celebration of Japanese culture. There was amazing food, kawaii & harajuku fashion, lots of cosplayers, video games and so much manga. It was amazing. Above is Emily and I signing up to Karaoke (aka our death wish). It was actually surprisingly fun screaming My Chemical Romance across the exhibition hall. And luckily for you, there is footage of this in my vlog at the end of the post. An actual Japanese person came up to me and said my outfit was 'so kawaii', so I basically win at life. Me chillin with Luffy from One Piece. The cat I'm holding is from one of my all time favourite animes, Fairy Tail. He is the best character ever. My T-shirt has the Attack on Titan Logo too. ALL THE ANIMES. Making Origami cranes and winning at a new Naruto video game. And finally, here is my vlog from the day (watch above or click HERE). I found these amazing shiny skirts (shown in the video) but I couldn't bring myself to spend £25 on one, so I'm thinking of doing a DIY? Let me know if that's something you'd like to see!